Ever since “secret ingredient: basil” a few weeks ago, I’ve been on a serious basil kick…mostly to the tune of this super easy pesto salad since it also uses up my garden tomatoes too. Now homemade pesto is not some revolutionary new dish but it’s just so tasty when the basil is fresh. Plus, it works great as a main dish with chicken or a crowd-pleasing BBQ/tailgate side dish and can easily be frozen for a little taste of summer come winter. 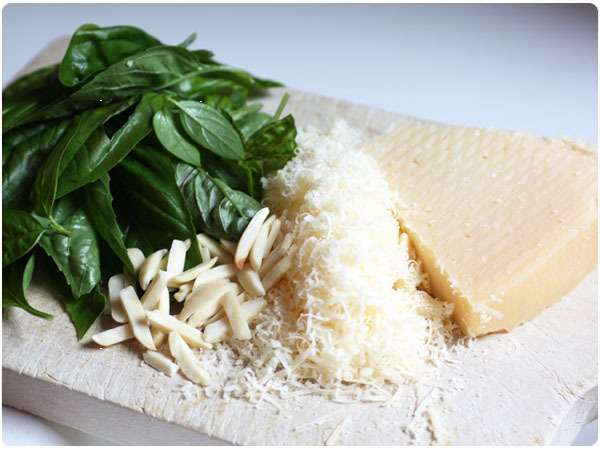 The pesto purists out there will probably scoff, but I prefer to use almonds instead of pine nuts in my pesto because of their health benefits and the fact that the leftovers can be used in more dishes. Also, when I make this I don’t actually measure the ingredients, so take these estimations as a starting point for creating pesto to your taste. 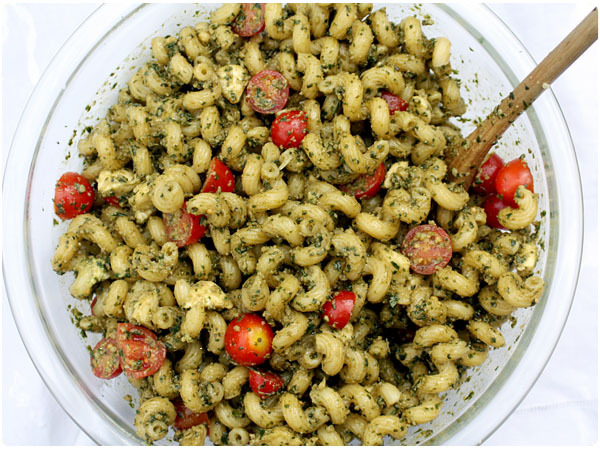 I prefer my pesto to not be too oily but you can make it just the way you like it! Wash and dry basil. 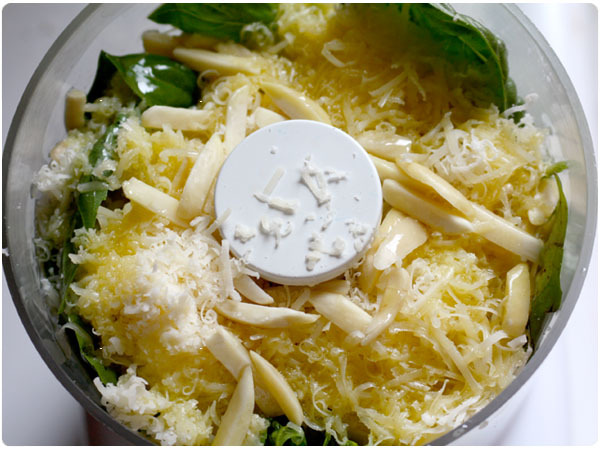 In a small food processor (I use the 3 C size) add 2/3 of the basil leaves, almonds, parmesan, garlic and half of the olive oil. Pulse several times to break down items and blend well. Add in salt and pepper and the remaining basil leaves. Pulse again and drizzle in remaining olive oil until pesto is getting smooth and the oil consistency meets your taste. If you accidentally add too much oil, add more basil and/or cheese and pulse again to soak it up. Cook pasta to al dente in boiling water. Meanwhile, slice tomatoes in half. 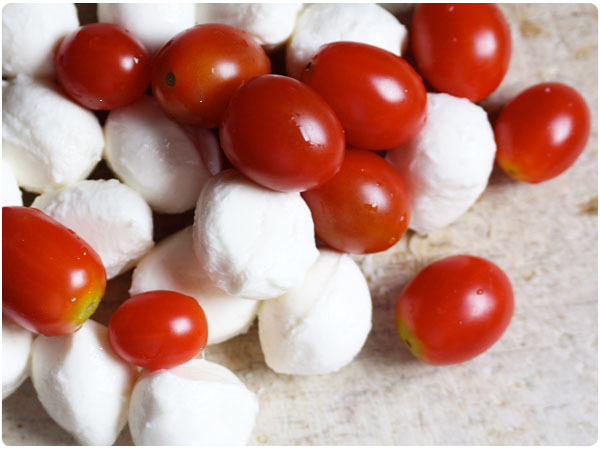 If you can find the itsy bitsy mozzarella balls, simply leave them as is. If they’re slightly larger, like the ones pictured, slice them in half or quarters. Drain noodles and rinse with cold water. Put pasta in a bowl and mix in pesto sauce. Add tomatoes and mozzarella. Stir gently until pesto is coating everything well. Taste it. If needed, sprinkle lightly with salt to bring out flavors, stirring salt in throughout. Serve warm or cold. Thanks Katie, going to go pick the basil right now. My tomato crop failed, but the basil is going crazy. Katie made this the last time we were down in Milwaukee… it is delicious!!! I recently saw an idea to place your homemade pesto into ice cube trays to freeze small portions. After the pesto cubes are completely frozen just pop them out, store them in a freezer container and then use them as needed for various recipes.